UPDATE 16:30 p.m. EDT: The M7-class flare was also associated with a coronal mass ejection or CME, another solar phenomenon that can send billions of tons of particles into space. While this CME was not Earth-directed, it has combined with an earlier CME, and the flank of the combined cloud may pass Earth. Particles from the CME cannot travel through the atmosphere to harm humans on Earth, but they can affect electronic systems in satellites and on the ground. Experimental NASA research models, based on observations from NASA's Solar Terrestrial Relations Observatory and ESA/NASA's Solar and Heliospheric Observatory show that the first CME began at 5:12 a.m. EDT, leaving the sun at about 400 miles per second. The second CME began at 9:24 a.m. EDT, leaving the sun at speeds of around 745 miles per second. Earth-directed CMEs can cause a space weather phenomenon called a geomagnetic storm, which occurs when they funnel energy into Earth's magnetic envelope, the magnetosphere, for an extended period of time. In the past, geomagnetic storms caused by CMEs of this strength have usually been mild. The NASA models also show that the combined CMEs will pass by the STEREO-A spacecraft and its mission operators have been notified. If warranted, operators can put spacecraft into safe mode to protect the instruments from the solar material. The sun emitted a mid-level solar flare on the morning of May 22, 2013. 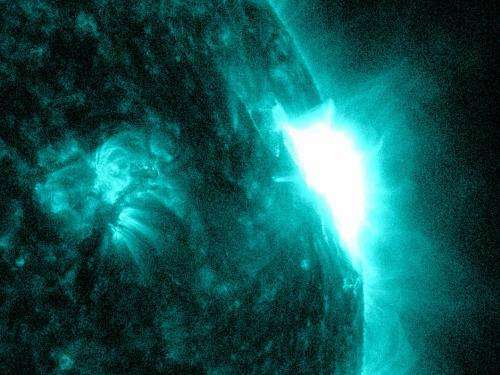 The flare peaked at 9:38 a.m. EDT and was classified as an M7. M-class flares are the weakest flares that can still cause some space weather effects near Earth. In the past, they have caused brief radio blackouts at the poles. Solar flares are powerful bursts of radiation. Harmful radiation from a flare cannot pass through Earth's atmosphere to physically affect humans on the ground, however—when intense enough—they can disturb the atmosphere in the layer where GPS and communications signals travel. This disrupts the radio signals for as long as the flare is ongoing, anywhere from minutes to hours. Increased numbers of flares are quite common at the moment, since the sun's normal 11-year activity cycle is ramping up toward solar maximum, which is expected in late 2013. Humans have tracked this solar cycle continuously since it was discovered in 1843, and it is normal for there to be many flares a day during the sun's peak activity. NOAA's Space Weather Prediction Center (http://swpc.noaa.gov) is the U.S. government's official source for space weather forecasts, alerts, watches and warnings. Updates will be provided as they are available on the flare and whether there was an associated coronal mass ejection or CME, another solar phenomenon that can send solar particles into space and affect electronic systems in satellites and on Earth.